Yeah, me too! But my problem is that when I have time to craft my creative mind has so many ideas I don’t know where to start! I have an idea to help you get more of them done. 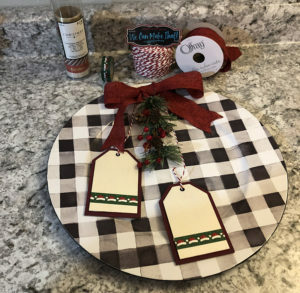 Easy DIY ideas for the holiday season are a must when we need a quick gift or fun holiday decor item for ourselves. So when you have time to create something, search #DIYGIFTWCMT on social media to find my DIYs you can make in no time at all. I must warn you; they will be so cute everyone will want one! Let the DIYGIFTWCMT fun begin! My first post for this series was a Buffalo Plaid charger. 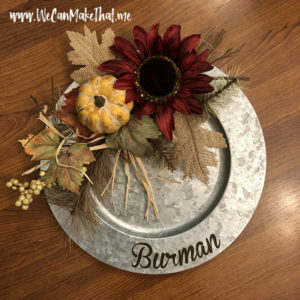 The fall decor charger I made with my friend for her home is made from a galvanized metal charger from Hobby Lobby. They are so cute and easy to find at so many stores these days. So many times over the holiday season we need a last minute gift idea. 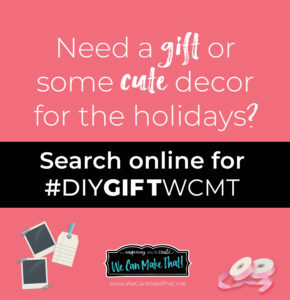 Here is a list of some of the items our #DIYGIFTWCMT will be helpful. What do you need help with? 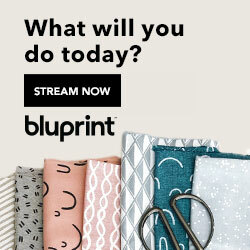 What type of DIYs are you looking to make but need a little help? I’d love to hear from you! Shoot me an email or add a comment below. #DIYGIFTWCMT idea: State decor or gifts. These are a few ideas I made with our state. The wall decor was a clearance item from TJMaxx. I painted over the saying and added the state cut out of Faux Leather woodgrain from Critcut®. 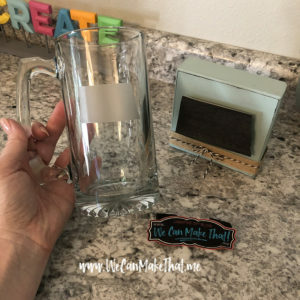 The Beer Stein was from the Dollar Tree, and I etched the glass to make it dishwasher safe. Here is a link to my glass etching blog post here at We Can Make That. 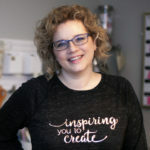 I love to create things (hence my websites tagline, Inspiring you to Create) so if you are feeling creative or crafty, simply browse the website. Even the SVGs in the shop usually have ideas. Or don’t forget to check out the Gallery pages I have to help inspire you. 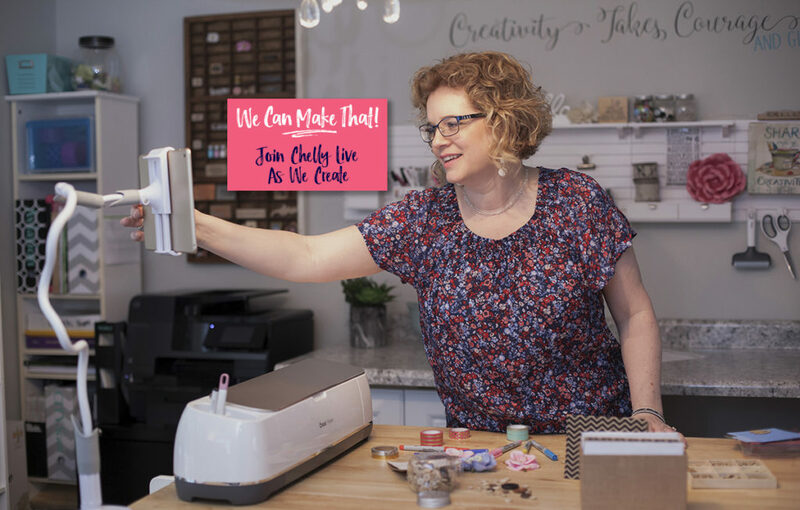 DIY lives with Chelly on Facebook. Join us today!